It might seem silly, but keeping the carpets in your vehicle clean is just as important as keeping the carpets in your home clean. Kingwood Carpet Cleaning Pros take care of all of your car and vehicle carpet cleaning needs. One of the best things about Kingwood Carpet Cleaning Pros is that we come to you! You do not need to go to a carwash or drive somewhere to get your car detailed and your vehicle carpets cleaned. We come to you to clean your vehicle carpets so that you do not need to leave the comfort of your home. You can keep your car in your garage or on the street, and our cleaning professionals will bring all of their equipment to you. If you are traveling or just stopping through the Kingwood area, we are the perfect place for you to stop to get your car carpets cleaned. We can do a thorough and quick, efficient wash for you so that you can be back on your way and continue your travels and journey. 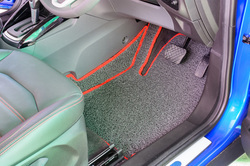 You might not realize it, but it can be dangerous to drive with dirty carpets! If you drop gum in the carpet, your foot could get stuck and you might not be able to get to the brakes. Similarly, if you spill something sticky on the floor, your foot might get stuck. Having sticky liquids stuck to your carpet will also attract more dirt and could even cause mold and mildew to grow. We once had a client who spilled milk in her car, but she didn’t think she needed to get her carpets cleaned because she wiped it all up right after the spill. Even though she was quick to clean it, she did not realize that the milk residue left behind, the stuff that had sunk far down into the carpet fibers, would cause mold and mildew to grow! Before she knew it, there was a musty smell on her carpets and black mold and begun to grow. If she had gotten her carpets cleaned sooner, the mold would have never happened and the carpet would have been easier to get cleaned. If you do a lot of driving and spend a lot of time in the car, you might be eating and snacking on the road. If you are, you are probably snacking frequently. If you get chips or crackers on your carpet and then you accidentally grind it into the carpet with your feet, you will have a big mess to clean up. A regular vacuum might not be strong enough to fully get all of the crumbs and residue out, and if you are on the road, you probably do not have a vacuum on you, anyway. So having us come to you if the best alternative. We will bring all of the equipment for you and can get it all cleaned up so that you can continue on your journey. We want you to be safe on the road, so make sure that the carpets in your vehicle and clean. We can do thorough shampoos and vacuuming in order to make sure that your carpets are clean and clear. You don’t want to have anything on your carpets that could mess with your driving abilities, and you also do not want to be stuck with smelly carpets or carpets that give off a bad odor. Try to visit us when you are at Westfield, TX in just 27 min car ride.